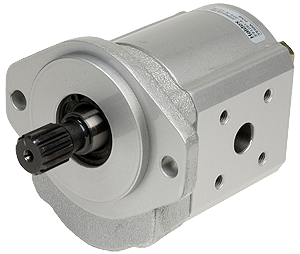 Concentric AB, formerly Haldex Hydraulics, is launching production of the FERRA F12 cast-iron hydraulic gear pump at its factory in Rockford, Illinois to increase availability for North American customers in construction and agricultural equipment, materials handling and other mobile/off-highway sectors. Concentric previously only manufactured the pump in its Hof, Germany plant and under the Haldex Hydraulics brand name. FERRA F12 can be used as a single unit or in multi-unit assemblies in combination with multiple FERRA pumps or with other Concentric pumps, giving customers a wide range of additional options for their system solutions. Extensive testing has demonstrated that the FERRA pump matches or exceeds competitors’ products in a smaller package with better power density, while offering significantly improved performance at lower speeds. Both bench tests and in-vehicle tests have shown that the design is highly suitable for high-flow implement and steering circuits and fan drive applications. FERRA F12 is a rugged, compact unit that is extremely robust across a broad temperature range, while also offering increased power density and good installation characteristics compared with conventional pumps. It is a two-piece design with both housing and flange of cast iron, which has made it possible to eliminate the rear cover and integrate the bearings into the housing and the flange. The gear and shaft are in one piece giving the drive and driven gear superior fatigue resistance and allowing the use of large-diameter journals with higher load-bearing capacity. The gear profile is of an advanced design optimized for reduced pulsation, lower ripple/noise and higher volumetric efficiency at low speeds. PTFE-impregnated bushings provide optimum alignment and a large support area capable of handling most indirect drives and fan loads. There are two pressure plates to ensure high volumetric efficiency at low speeds, each with a bronze surface for optimum strength and wear characteristics, while integrated seals reduce clearance, offset axial loading and balance themselves as pressure increases. Concentric offers F12 pumps with a range of port and mounting options, splined, keyed or tapered drive shafts and available with displacements from 16 to 41 cc/rev and pressures up to 276 bar (4000 psi up to 30 cc/ rev) and maximum speed of 3000 rpm.